First introduced to the U.S. in 2008 as a non-California compliant 49-state model, Kawasaki’s Versys 650 immediately earned praise from journalists, experienced riders, and commuters who could appreciate its practical blending of a nimble sporting motorcycle – and – a truly comfortable chassis. Motorcycle.com’s loudest complaint about the original Versys was merely that it wasn’t legal in California, and even that fact couldn’t stop it from earning 2008 Motorcycle of the Year honors from one of the largest U.S. print mags. Kawasaki made the Versys legal everywhere in 2009 when it achieved California compliance. 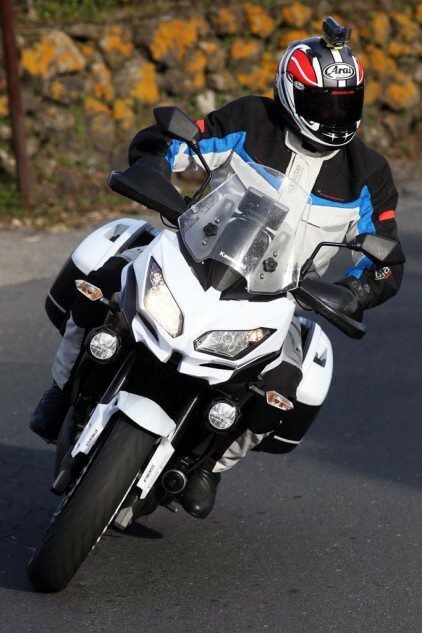 The 2010 update saw numerous small tweaks aimed at taming vibrations and minor cosmetic changes with the styling of its headlight while also eliminating an area of the upper fairing that loudly resonated, causing its panels to vibrate against each other at certain revs. The 2013 model Versys 650 gained ABS brakes in North America, a feature the rest of the world got in 2012. This brings us to the rugged Italian island of Sicily for the press launch of the upgraded and significantly re-styled 2015 Kawasaki Versys 650 ABS and 650 LT sport/adventure motorcycles alongside their bigger brother, the Versys 1000 LT.
Upright seating and relaxed footpeg positions yield an accommodating ergonomic triangle suitable for commuter use or touring jaunts. The LT version pictured here adds saddlebags and hand guards to the standard Versys ABS. The 2015 Versys 650 LT was a hugely entertaining motorcycle to hustle along the tight, twisty Sicilian roads that are so familiar to older race fans, being the actual surface and several segments of the original route used for the legendary Targa Florio. 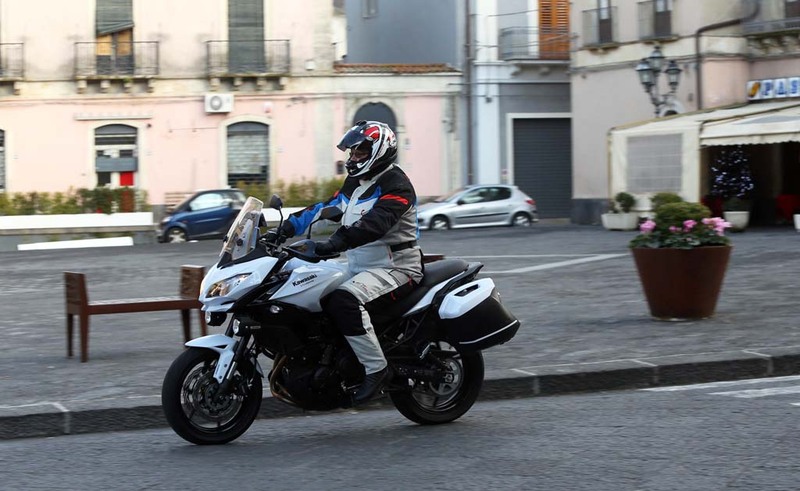 Unsurprisingly, the new LT also remained comfortable and unflustered over the cobblestone streets, rough country lanes – and everywhere else on the island – something a modern superbike could never hope to achieve. I’ve always suspected that the Versys’ riding position, particularly the bend and positioning of its handlebars, was just about perfect for transitioning back and forth through tight curves, making it seem like the Versys has honest sporting prowess baked right into its soul. That is something Versys class competitors like the Honda NC700X or Suzuki V-Strom really can’t offer, as they simply lack the nimbleness, feedback, and outright pace when the going gets truly fast. Those performance traits seeped-through every pore as we flogged the 650 LTs over the serpentine volcanic roads along the slopes of Mt. Etna. The face of the new Versys is much more handsome than the awkward schnoz of the previous version. Additional wind protection is provided by a larger and adjustable windscreen. Kawasaki wisely decided to update the homely face of the Versys 650 with a new upper fairing and sleek side-by-side headlights inspired by Kawasaki’s Ninja models. The new “Kawasaki Face” effectively transforms both the 650 and the (previously hideous) Versys 1000 directly into, dare I say, pretty motorcycles. As an added bonus, the new fairing upper is larger than the outgoing version and mounts a taller and wider windscreen that can now be height-adjusted without any tools. The added protection of the larger fairing and screen were much appreciated, as the press ride took our group through chilly temps and a fairly heavy rain shower. Weather management was fairly effective, diverting water into areas of the slipstream that channeled around instead of splashing-into me. Also appreciated, were the LT model’s standard hand guards which reduced the soaking around my hands and wrists, as well lessening the wind-chill factor. That’s a pretty good deal if you ask me: better looking and more effective. Kawasaki switched to a new one-piece exhaust design that they claim boosts high-rpm power. I really didn’t notice much of a difference in thrust during our ride; what I did notice was that the 2015 model’s redline has actually been lowered by 500 rpm to 10,000, a fact Kawasaki didn’t mention in the technical briefing. Another one they didn’t mention: the 2015 engine’s compression ratio is now listed as two tenths higher, from 10.6:1 to 10.8:1. They did, however, mention that the bike’s ECU tuning has been tweaked to improve fuel efficiency, but they did not have details to share. Definitely worth sharing is the fact the 2015 model received a half-gallon fuel capacity boost thanks to a new tank with a wider top section. Coupled with the ECU tweaks, Kawasaki claims the 2015 model’s 5.5-gallon tank will take it farther than ever. I average right around 140 miles between fill-ups on my own 2009 (5-gallon) Versys, but I’m a very aggressive rider. The average commuter or tourer should see close to 200 miles or more between fill-ups on a 2015 model. The Versys received a rubber-isolated upper-rear engine mount for the 2010 model, but Kawasaki has now isolated the pair of front mounts in a continued attempt to quell the natural vibes of the 180-degree crank in its 649cc parallel-Twin powerplant. While they were at it, they swapped the handlebar mounts to rubber-equipped units as well. The 2010 modification was of only minor benefit, as it made marginal difference to overall vibration levels. Vibration-reduction strategies on the new Versys nicely shield a rider from objectionable tingles. However, it took less than a mile of riding to discover that those two new rubber engine mounts and the isolated bars have taken the Versys 650 ABS and LT models into entirely new territory: parallel-Twins that actually feel smooth in the real world. 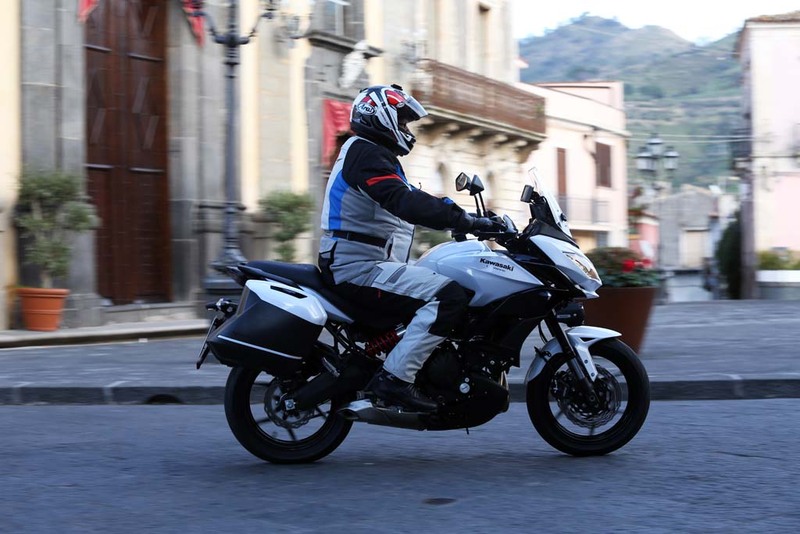 The overwhelming impression compared to previous models is one of refinement – no rattling noises, no tingling body parts, just nice, usable thrust easily accessible for whatever a rider desires. Speaking of rattles and rider annoyances, older Versys models seem to suffer from overly notchy shifting that could occasionally even be described as clunky. Kawasaki didn’t make any claims for gearbox refinements, but I and a couple fellow editors believe our 2015 test bikes were noticeably more smooth and quiet when shifting compared to any previous Versys we’d ridden. So that’s a definite positive. Now for a definite negative: The bikes we tested were all equipped with a full complement of Kawasaki accessory items, including electric grip warmers with three heat levels. The problem is that the right grip gets much warmer than the left grip. In high-heat mode the right grip got uncomfortably hot during our rainy 55-degree test ride, while the left grip felt nicely warm. The disparity remained consistent at other heat levels, the right grip comfortable at medium heat with the left grip barely warm, etc. It’s an issue that several other editors noticed as well, so it’s tough to blame it on a one-off or poor installation. This knob for the hydraulically adjustable shock preload allows easy tweaking to accommodate various loads. The Versys in my garage has lived almost its entire life with its rear spring preload maxed-out and the shock’s rebound damping slowed as much as practical. But even with the rebound damping adjuster maxxed, my bike will still spring back like a pogo following large impacts and G-outs. 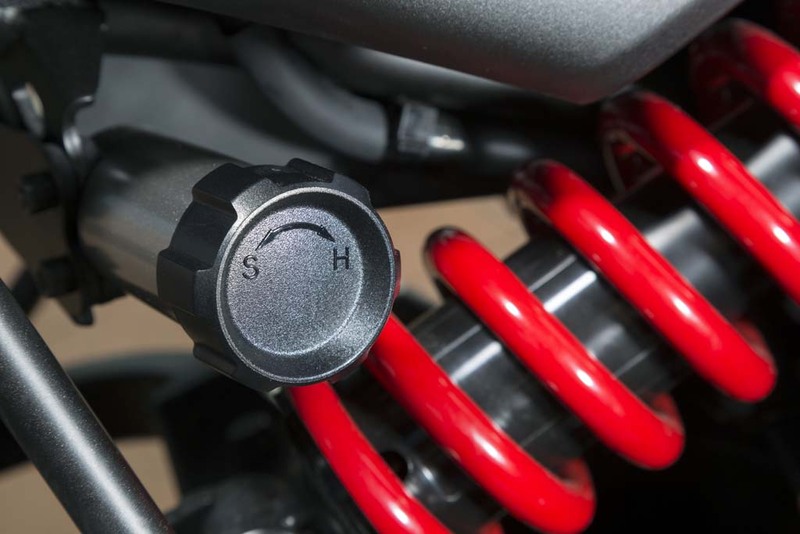 Prior to the press ride, I was worried Kawasaki’s deletion of the rear rebound damping adjuster would result in even more of a pogo effect from the 2015’s new KYB shock. But after a full day of riding, I am glad to report that even without an adjuster, the new rear shock’s rebound characteristics are not any more pronounced than what I experience on my own bike. Furthermore, the remote adjuster for spring preload is a great addition compared to the old ramped collar, allowing easy roadside adjustments with the twist of a wheel. Its right-side location requires a little throttle juggling to fine-tune while in motion. The new Separate Function Fork (SFF splits damping and preload functions to separate sides, one leg changes rebound damping, the other leg changes spring preload) works well with the rear shock, with the same amount of control and slightly less harshness than the previous model. A decent suspension coupled with a narrow chassis and an upright riding position have always made the Versys greater than the sum of its parts, and the 2015 model’s suspension changes have resulted in an improved ride without suppressing the bike’s fun-loving personality. The Versys 650 has always been great at the around-town shuffle. While tweaking the suspension and handling, Kawasaki reached-out for a new tire. 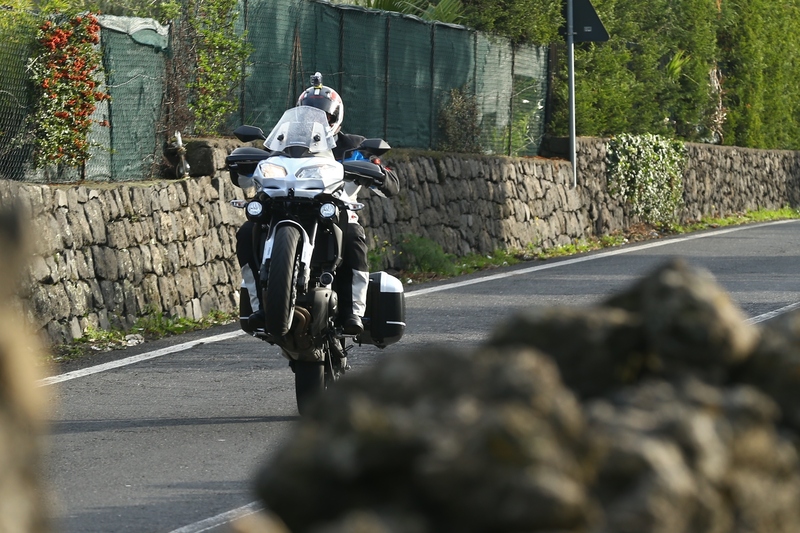 Dunlop responded with a Versys 650-specific version of the Sportmax D222. Like most modern sport-touring tires, grip levels are very impressive in the wet or dry. The D222s offer easy turn-in and quick response across the center of the tread, and I think they make a good match for the Versys’ personality while offering what should be a respectable service life. Easily my favorite 2015 dynamic upgrade is the new Nissin front brakes. The calipers use a look-alike “monoblock” style based on the appearance of modern supersport units, but they are really the same bargain basement two-piston pin-slide type caliper design as used on previous models. The real benefit comes from the well-matched pairing of a new front master cylinder with a higher leverage ratio, and more aggressive brake pads offering much more initial bite. The spec may not be terribly impressive, but the response and power represent a definite and confidence-inspiring braking upgrade, especially when speeds start to rise into the fun zone. All 2015 Versys models are equipped with standard ABS which works nicely in front but may be a little too intrusive and even a little clunky feeling in the rear, which uses a new caliper and larger 250mm rear rotor. 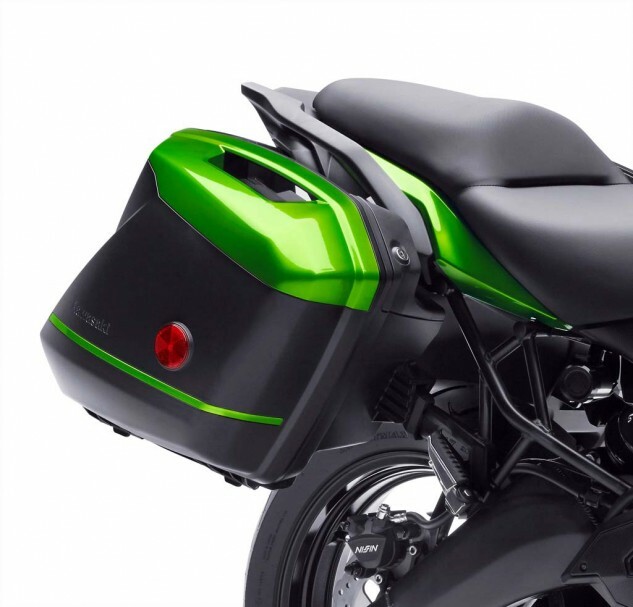 Kawasaki is getting its design money’s worth out of these Ninja 1000 KQR bags, which are now showing-up on several of their models. They look just as good on this green Versys 650 LT as they do on our white test bike. 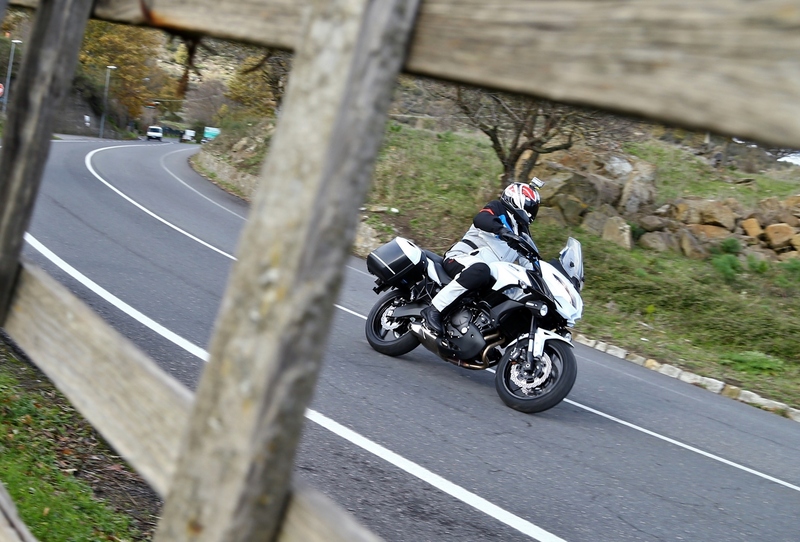 Both the Versys 650 ABS and the LT tested here have received a stronger rear subframe that can support more weight. It was designed to easily integrate optional single-key Kawasaki Quick Release (KQR) hard bags which – along with handguards – are standard on the new 650 LT model. Those KQR bags can also be combined with an optional same-key KQR 47-liter Top Case for a total capacity of 103 liters. Like most modern designs, the bags are quick and easy to mount and remove. The mounts blend into into the subframe so as not to compromise the bike’s appearance when riding without bags. Even with an aggressive pace over bumpy roads, there was no detectable flapping or shifting of the bags and no sense of torsional twisting through the subframe. That means Kawasaki did their engineering homework. 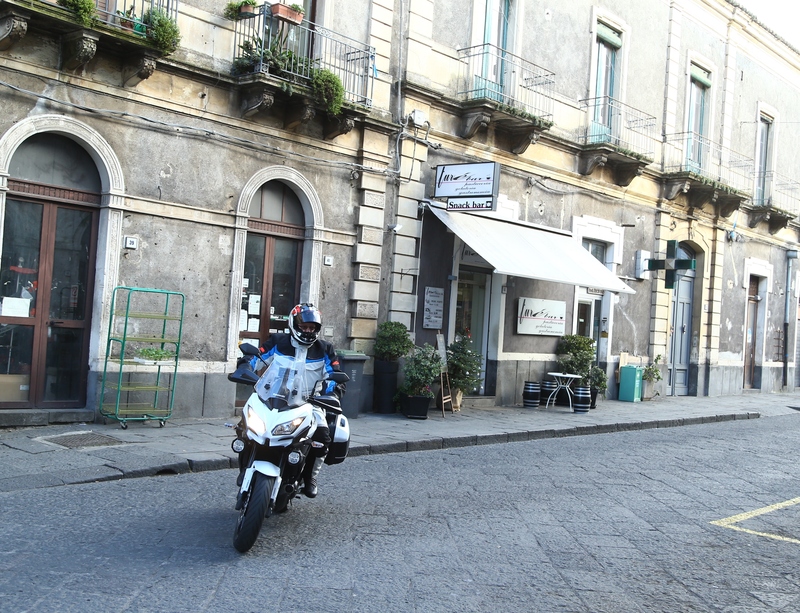 It also means that adding lightly-loaded bags will have an almost undetectable effect on the bike’s handling. Another nice touch in the new subframe is its clean integration of passenger grab-handles, a feature that is sure to please anyone who finds themselves perched way up there on the rear saddle, a position my wife says feels more like sitting on a high-barstool which makes her somewhat uneasy as a passenger on my Versys. I blame it on the wheelies. 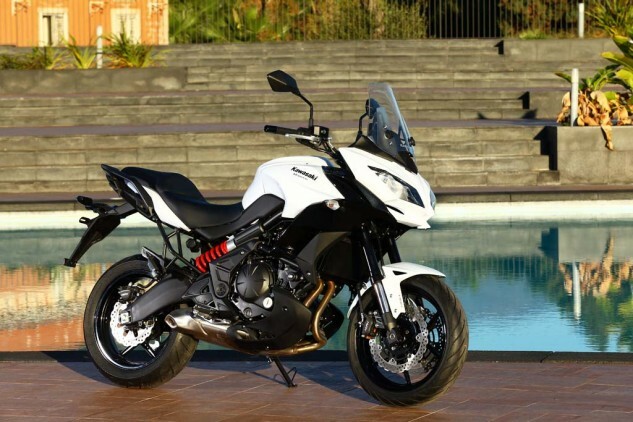 Given its displacement, modest power and practical pricing it’s logical to assume a 650 Versys would be viewed as a “beginner” or “budget” bike, something that makes the following facts all the more interesting: The average Versys owner is a 40-year-old male who is a highly experienced rider and has an above-average household income. The reason for that is simple. Experienced middle-aged riders tend to value comfort, and if they are not cruiser types, they also tend to value real-world performance … and that is precisely what a Versys has always offered. I’m not alone in my praise for the Versys though; there are a lot of publications attending this combined U.S. / Europe introduction, and the buzz from those editors less familiar with the Versys carries a tone of pleasant surprise regarding how much fun this otherwise unassuming motorcycle is to ride. Other editors who were already familiar with its charms are also saying mostly nice things. In fact, the Editor-in-Chief from a large competing publication summed it up nicely during our mid-ride lunch, proclaiming: “The Versys 650 has always been quietly brilliant.” Like me, he put his money where his mouth was when he bought one a few years ago. Leggy riders will appreciate the extra room afforded by the Versys’ upright layout. Even if its seat-to-peg distance remains slightly shorter than ideal for long distance riding, it still has more legroom than any full-on sportbike, and Kawasaki has now repositioned the 650’s footpegs 15mm lower and 20mm further forward relative to the previous model’s. However, Kawasaki also tried to keep the top of the seat relatively low in the interest of a moderate 33.1 inch stand-over height which is actually just over 5mm closer to the ground than the seat on the outgoing model. Combining the new seat with the lower pegs means net vertical seat-to-peg distance is 10mm longer than last year. Unfortunately, I’m used to the original “sportbike” pegs on my ’09 Versys, so the difference is actually negligible for me. 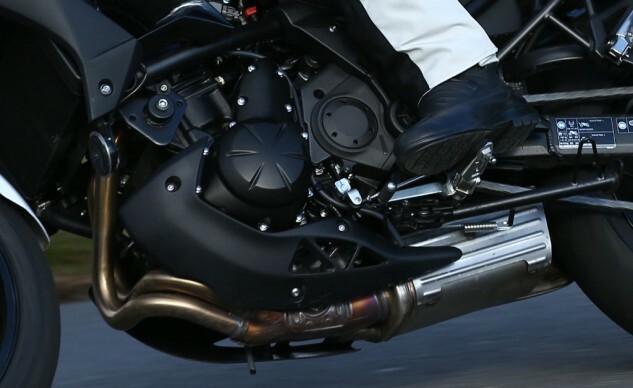 From 2010 on, Kawasaki added thick rubber vibration-isolating pads to the tops of the pegs, eating-up several millimeters of precious legroom in the process. Every little bit helps on longer rides, so I do appreciate their effort. Of course, a change back to the pre-2010 no- rubber-topped pegs would free-up even more legroom … hint. The 10mm increase in seat-to-peg distance means large-limbed folks like Editorial Director Alexander can unkink a little. Some things in life are free! The bagless 2014 Versys 650 ABS retailed for $7,999, and the new 2015 version -with all the upgrades described above, minus the new bags and hand guards- is still $7,999. It’s great when a new model year vehicle holds the line on price, but all the more impressive when the price stays the same while upgrades are heaped on top. Kudos to Kawasaki for that little trick. Want the integrated hard bags and handguards as well, then get the Versys 650 LT for just $700 more. At the end of the day, riding this new version has done nothing to change my long-standing assertion that, given riders of equal skill, there are very few motorcycles capable of pulling-away from a Versys 650 over a twisty road. Of the bikes that could (KTM Super Duke 1290 R, BMW S1000R, Superbikes, etc), none would be nearly as affordable to buy and insure, nor as friendly and easy to operate for everyday use. From a face that only a loyal owner could love to an attractive mount – all in one model year. Here, Sean demonstrates the angle of optimum protection from the elements. Before wrapping up my review of the 2015 Versys, this author must offer a confession: As a former member of Kawasaki’s marketing team from 2006 through 2013, I helped chase or guide the press rides for almost every new Kawasaki streetbike during that period. I became very much enamored with the Versys platform, and it had nothing to do with the fact that Kawasaki was paying my salary. Au contraire, the issues or flaws that might damn one of their machines are well known to me, and any potential for bias occupies my mind to the point of distraction. You hereby have my promise to tell it to you straight, without rose-colored glasses, always. I actually bought a 2009 Versys a few years ago. The reason the 650 earned my long-term love is this: Motorcycle press introductions involve days of riding over several waves of journalists, and OEM staff riders are often able to choose their mount from any bike in that manufacturer’s stable. 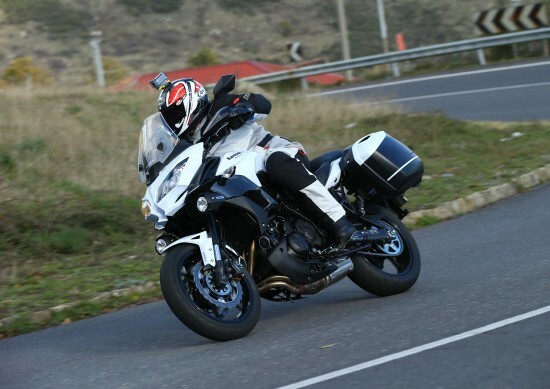 At 40+ years old, with frequent aches from old racing injuries, and now weighing far more than I should, my motorcycle choices were largely influenced by two considerations: comfort and handling. After riding every Kawasaki streetbike, rapidly, I discovered that nothing in Kawasaki’s lineup could touch a Versys for long fast-paced days in the saddle. I ended up choosing to use a Versys – exclusively – for every introduction towards the end of my time with Kawasaki, including leading very spirited road rides at the launches of the Ninja 300, Ninja ZX-6R and Ninja 1000, all of which took place over some of the best twisty roads in the country. Even when technically out-gunned, a Versys always fit right in at the Journalist GP. Furthermore, I ended every one of those rides un-cramped and with a smile in my heart. The Versys honestly earned my bias. VERsitile SYStem, indeed. Jack of all trades and almost masters them!